The following information is sourced from the "Atlas of Technical Data" (revised edition March 1981) issued by the South Australian Department of Mines and Energy (SADME). The publication includes index maps and listings of the earliest aeromagnetic surveys in South Australia. The contracts flown by Adastra are highlighted on the maps and listed in the following tables. Note: No 9 (marked in green on the map) was flown by CGG of France for Hematite/BHP. The offshore area was flown in 1968 using East-West Airlines DC-3 VH-PWM. 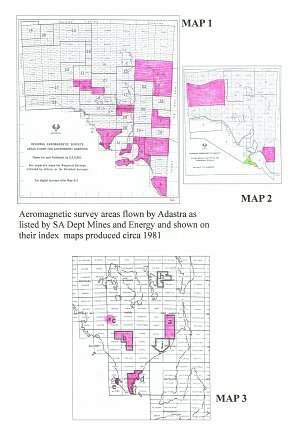 There were possibly other aeromagnetic surveys flown by Adastra in South Australia for commercial customers (rather than government departments or commercial companies seeking government assistance) that have not made nor ever will make such lists.